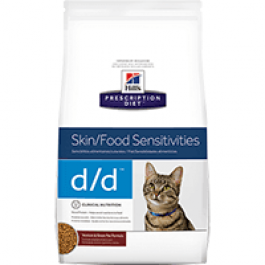 Prescription Diet Feline d/d Venison and Green Pea is formulated for the nutritional management of cats with food allergy and intolerance. 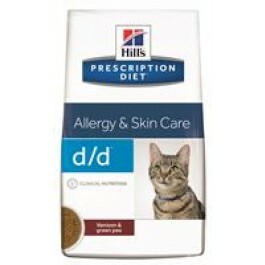 Venison and peas are rarely used in cat food, this decreases the risk that your allergic cat react to this diet. Helps to reduce signs of adverse reactions to food and supports healthy skin function with the right levels of natural omega-3 fatty acids. 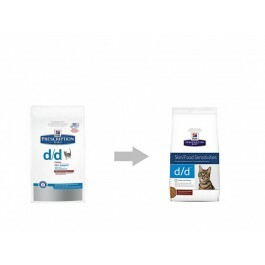 Provides a great taste and facilitates mixed feeding of both wet and dry food for great cat enjoyment. Helps to relieve or soothe uncomfortable digestive signs caused by adverse reactions to food. This food should be used only when recommended by a vet following the examination of your pet. Whilst your pet is being fed this diet, it is recommended that you seek veterinary advice at least every 6 months and immediately if your pet’s condition deteriorates in any way.